Today: Amanda makes an easy, wholesome weeknight dinner -- is she feeling ok? I know it's irrational but sometimes dealing with ground meat seems so much more approachable than, say, a whole chicken or a steak. Yes, you can stick the former in the oven to roast and the latter under the broiler, and can have dinner ready without a whole lot of angst. But ground meat wins the battle for me. It requires no trimming or dry brining. It just goes into the pan and doesn't ask for a lot other than salt and a good bit of heat to brown. A few years ago when I was working on The Essential New York Times Cookbook, I made Mark Bittman's Crispy Chickpeas with Ground Meat and it was a revelation. To make it, you toss some ground beef and chickpeas in a pan to get brown and toasted. You season them generously with cumin, dried ancho chile, garlic and pepper. Using the broth from cooking the chickpeas (because your kitchen is that efficient), you simmer the mixture a bit, then douse the pot of brown goodness with cilantro, add a little rice and yogurt, a salad if you're feeling ambitious -- and you have a fine and wholesome meal on your hands. I've since messed with the recipe, replacing the beef with lamb and the starchy chickpeas with more buttoned-up and mineral-scented French green lentils. This is the kind of food I like making on weeknights. And if I were you, I'd double the batch so you have plenty left over for work lunches. This recipe has become a weeknight regular for me. I have started adding coriander and at the very end, some garam masala. I've served it with parathas, corn tortillas (with some lime soaked onions and hot peppers), and rice. My husband loves all iterations of this. I love making this because its so easy on a weeknight and gives me something to look forward to for lunches. I had no French lentils so I just used the green lentils grown locally around here. I smartened it up with a bit of asafoetida and used cumin seeds and curry leaves fried in the oil before adding the meat. Ate it taco-style in a pita with yogurt sauce and cucumber. Definitely making this again. I made this last night. We loved it. It kind of reminded me of a Middle Eastern taco filling (except healthier than most ground meat taco fillings). My wife immediately started to think of things we could add to make it even better (because that's what we do; we hardly ever use a recipe we didn't invent as written) and thought adding some ground coriander might brighten it up even more as a partner to the cilantro. Initial tests were very positive. We're definitely going to keep this one around. I should mention that I cooked the lentil in some lamb stock I made earlier this year. We've been getting lamb from a local farmer and it's much better (less gamey) than the store-bought lamb. Great -- I just bought ground lamb so I could make it again this week -- am going to try the coriander. Thanks. Enjoyed this recipe last night. I cooked the lentils in vegetable stock. I fried up some crispy onions and used to top when plating--great flavor combo. Leftovers for lunch, I threw in some baby spinach leaves while heating up in a pan. Came out very tasty. Love this recipe! The combo of sophisticated and inspired, yet family friendly and quick is not one I often come across. Thanks, Amanda! By the way, I'm curious how it turned out with beef. It's very good with beef and you can definitely sub it in here. The chickpeas are what give it a different vibe in the other version. They're larger, starchier, and sweeter than the lentils. This was so easy to make after I came home exhausted. Served it with Indian parathas that I already had in the fridge, but it would be awesome with rice, too. I had lots leftover for lunches. Thanks for this awesome weeknight recipe. Your comment makes me so happy -- glad it worked for you! Made this for the family last night, big hit. Its been added to the "regulars" list. No leftovers! what's the difference between french green lentils and regular lentils? French green lentils are a little smaller and plumper, and they retain their shape nicely once cooked. if canned lentils are being used, is it best to just season a cup of stock in replacement of the water they were cooked it, also would the same go for canned chickpeas? I have red lentils on hand (vs. green)...would that work as well? Red lentils fall apart and get mushier, but I still think they could work. You may need to adjust the recipe a bit to get them to crisp, but I say go for it! Red lentils get mushy fast! They sure do...made this last night with the red lentils; also subbed 1 t dried rosemary and 1 t dried thyme for the cumin and eliminated the ancho...wanted a French flavor rather than southwest. Used parsley instead of cilantro. Served to my husband and 18 year old son....they loved the favors, but the consistency was mushy due to the red lentils. All agreed we should try again with the green ...which is a good sign! As soon as my cleanse is over (& I can have carbs again) this is going on the menu, though I will sub flat leaf parsley for the dreaded cilantro. I can taste it in my head already! I can imagine a ladle of this nestled in a big butterhead lettuce leaf, or better yet as a topping for piadina. Oh...this would be good with a bag of baby spinach sauteed in with it and some harissa paste. I added some baby spinach leaves when reheating the next day for lunch. Came out good. 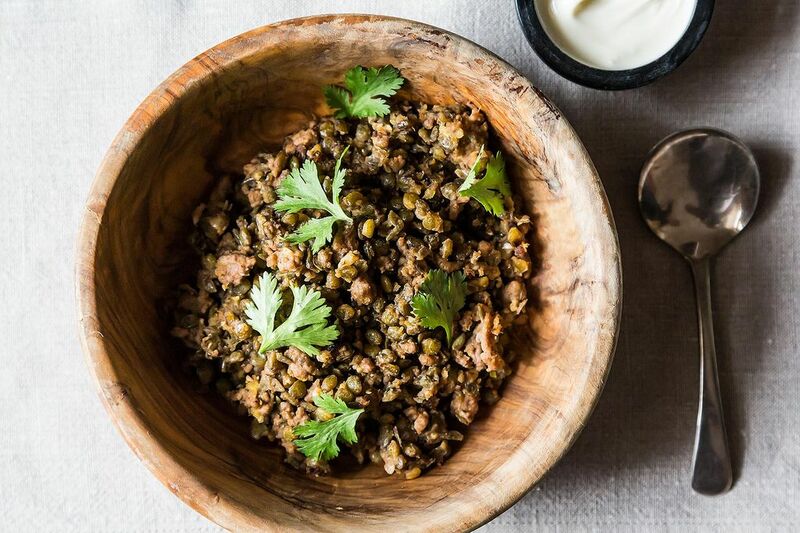 Lentils have long been one of our favorites on wellfedheart.com. I usually make a bunch at the first of the week so they will be on hand to add to any dish I'm cooking. Love this one! Hi Amanda- This sounds like exactly what I need to make for dinner tonight. I have been on a "beans with every meal" kick for months, and lentils are a fav. Did you cook the lentils in water or broth? Did you season them? Thanks! You can cook them in either water or broth (I've done both), and definitely season them!